Innes Portable Jumps is a new business started by Jamie Innes in the Scottish Borders. Using experience gained over the last 40 years of being involved with Horse Trials, Point to Points, Hunting and as Ex British Events Technical Adviser I am designing and building Portable and Fixed Horse Jumps to suit all ages. 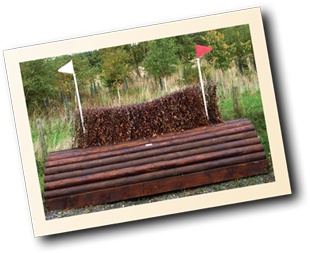 All types of Portable Cross Country Jumps and Schooling Fences are made to your specification for ease of transport and are able to withstand heavy use. We are based near Jedburgh in the Scottish Borders and will deliver all Portable Horse Jumps and brush fences to within 100 miles of our base.